This article looks at the factions of the ruling class battling for positions and control over the state in South. It considers whether such battles offer anything to the working class in the country. Of course, in the one corner of the fight is Zuma faction - comprised of sections of Black Economic Empowerment (BEE) capitalists, top state officials, and politicians aligned to Zuma - while in the other corner is the Ramaphosa/Gordhan faction - comprised of sections of the ANC leadership such as Ramaphosa and Gordhan, white capital and the South African Communist Party (SACP). These factions have recently been standing toe to toe exchanging blows and in the process, metaphorical blood has been spilled: those of a few Cabinet Ministers, including Pravin Gordhan. Of course the working class (workers and the unemployed) have been relegated to ringside spectators. As with all boxing spectators, the fighting factions are attempting to vie for their support; while ensuring such working class spectators stay well out of the ring. The question though is: does this battle within the ruling class in South Africa offer anything to the workers and the unemployed of the country? Before answering that question, let’s recap on some of the latest actions that have occurred in the spectacle of elite infighting. The latest exchange of blows began when news broke that President Zuma intended to imminently fire Pravin Gordhan. 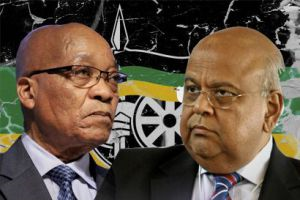 In fact, Zuma told the Executive of the African National Congress (ANC) that relations between himself and Gordhan had become untenable and that his only choice was to send the Finance Minister packing. Bam…things were underway. This was soon followed with a left hook by Zuma when he recalled the Minister of Finance (and all that is apparently holy) from a schmoozing trip to attract foreign investment to the country, in preparation to sack him. The Zuma faction was reigning blows on its opponents. It soon, however, became clear that the Zuma faction was not going score an early knock-out. The Ramaphosa/Gordhan faction was going to make a fight of it. Almost on cue, sections of the ANC opposed to Zuma – including ex-President Motlanthe – fired back, using the funeral of Ahmed Kathrada to lambast the President’s latest actions. As part of this, Gordhan was endlessly praised by speakers and received a standing ovation from the majority who attended. Soon the real heavyweights, white capital, stepped into the fight to back their faction and their men, Ramaphosa and Gordhan. This saw sections white capital firing their own one-two at Zuma. The Banking Association and the Chamber of Mines bluntly stated that the Presidents’ renewed bid to rid himself and his cronies of Gordhan was dangerous and would have consequences. Sighting the fall of the Rand, they noted that Zuma’s actions were once again undermining the Treasuries’ bid to placate investors (read here: speculators) over their concerns about state ‘capture’. The self-appointed vanguard, the South African Communist Party (SACP), also came out swinging for its faction. It stated that should Gordhan be axed, its members in the Cabinet would resign. In this fight the SACP though appears to be the lightweight of its faction because although Gordhan is now gone, at the time of writing, the SACP appears to have backed down – probably due to the high salaries they receive as Cabinet Ministers and officials in the state – as they have not carried out this threat to resign on mass. Its political underling, the Congress of South African Trade Unions (the ailing old corner man whose body is in terminal decline), managed to screech from the corner and also threaten Zuma with dire consequences should he make Gordhan ‘redundant’ and thereby open further avenues for looting state sources. So the fight between one section of the ruling class - represented by Zuma - and the other - represented by Ramaphosa/Gordhan - is well and truly on. In this rumble, it is patently obvious that Zuma and his faction are rotten. They have been involved in one corrupt deal after another, and have been brazen when caught out. Zuma’s endless giggling over Nkandla is the tip of the iceberg. Over and above this, however, they have also supported and imposed neoliberal policies on the working class in South Africa. Hence, it is clear they offer nothing to the working class (workers and the unemployed). But does the other faction, the Ramaphosa/Gordhan faction offer the working class anything? One brief glance at the history of some of those in the faction provides a clear answer. When one looks at the figurehead of the faction, Ramaphosa, one finds endless dirt. Ramaphosa was the BEE man of choice for sections of white capital after apartheid fell. Suddenly the ex-trade unionist became a billionaire overnight. To be sure, white capital was not buying Ramaphosa’s business acumen when they provided him shares and board positions on and in their companies; they were buying the influence he had in the ANC and the state in order to further their own capital accumulation. By 2012, Ramaphosa came to have his hands in many pies, in partnership with white and foreign capital. When one of the companies he owned shares in, Lonmin, experienced a wildcat strike at Marikana he made a few phone calls to Ministers and top officials in the police and 34 mine workers were shot dead to end the strike. Then there is Ramaphosa’s political partner Pravin. Year after year, he has been at the head of drawing up one neoliberal budget after another. The consequences have been devastating. Class and race inequalities have continued to grow, with the black working class being the hardest hit. It was also Gordhan who recently dismissed calls for ABSA bank to pay back a corrupt bailout it received from the state during the dying days of apartheid. Gordhan is the prize fighter of established capital in South Africa. Of course, the majority of white capital are part and parcel of the Ramaphosa/Gordhan faction. To say the least they have a dismal record. Corruption during the apartheid period was central to their operations. Banks belonging to the Banking Association were essential to sanctions busting during apartheid. As for the Chamber of Mines, the wealth of its members comes from the extreme exploitation of black workers – workers that were forced into working on the mines through the colonial states’ conquest of land and imposition of the hut and poll taxes. Forced to work in appalling conditions, over 54 000 mine workers have died in workplace accidents in companies that form the Chamber of Mines since 1904 (when records on accidents first began to be kept) – which is more deaths than the US suffered during the Vietnam War. Mining companies in South Africa literally have blood on their hands. The practices of white capital today continue to be as bad as in the apartheid days. For example, major banks were recently caught out colluding to fix the Rand in order to make billions; while mining houses continue to exploit black migrant labour to generate huge profits and then use transfer pricing to whisk the money out of the country. Then there is the so-called vanguard in the form of the SACP – also part and parcel of the Ramaphosa/Gordhan faction. It bemoans state capture and corruption, yet it is mired in corruption and nepotism itself. Top SACP members pack the echelons of the state; many not because of their skills and talents; but because of political connections. The SACP – self avowed anti-capitalists – also have their own investment arm, which too has shares in mining companies. When the SACP head, Blade Nzimande, became Minister of Higher Education, it cannot be an accident that an education institute that is partly owned by the SACP’s investment arm received funding of over R 200 million from a Skills Education Training Authority ultimately controlled by the Minister. Given the corruption and exploitation associated with those in the Ramaphosa/Gordhan faction, it is also clear that this faction offers nothing to workers and the poor. In fact, like the Zuma faction, it has used the working class as a punch bag. Instead of backing one faction of the ruling class over another; the working class (and the black section in particular) rather needs to step into the ring as an independent force to fight against class rule, capitalism and its state. It is class rule, capitalism and the state that generates exploitation and corruption – the ruling class’s actions in South Africa are simply symptoms of the rotten system, even those of the Zuma faction. Capitalism was born of exploitation, brutality and corruption. It was built on slave labour in the Americas and parts of Asia. In Africa it was built on genocide and conquest. Even in Europe, it was founded on disposition of the land, denying poor people a living and forcing them to work for a pittance in the mines and factories of Europe. Child labour formed part of the horrors of capitalism on that continent too. From the start, capitalism’s foundations were brutal and corrupt – much like how boxing is run in the modern age. It remains so today: workers remain exploited; labour is still abused in most parts of the world; imperialism is rife; inequality is at its highest in history; millions of people starve because of the profit motives of food companies; billions of people are now redundant to the system and are mired in unemployment; and most people because of the profit motive in housing live in slums. Likewise states too have only existed to enforce the rule of an elite minority over a majority. Like in a rigged fight, the state is always against the working class. In fact, states are central to minority class rule; and ruling classes have always used them to accumulate wealth. In South Africa this is particularly stark as a black elite relies on the state and connections to it for its wealth – despite BEE, white capital still largely owns a majority of businesses; hence the state is central to an ANC elites’ wealth. States and corruption, therefore, go hand in hand. Even the so-called historical bastion of a ‘clean’ state, West Germany, was mired in corruption – one of the largest ever corrupt deals involved West German politicians and officials being bribed to buy flawed Starfighter jets. The reality is that the Zuma faction and the Ramaphosa/Gordhan faction offer nothing to the working class – both are vile and are fighting in the ring solely for their own paydays. Yet both too are symptoms of history and symptoms of class rule, capitalism and the state; including the forms these took in South Africa. If the working class wants to fight corruption; rather than relying on intra elite battles to do so; workers and the unemployed should fight the system that have led us into the situation we are in. It is the rotten system itself that needs to receive a knockout blow and only the working class can deliver that.